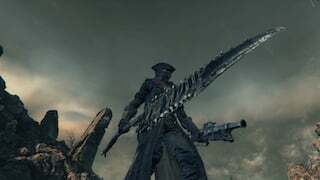 The Saw Spear is a Trick Weapon in Bloodborne. There are 3 versions of this weapon: Normal, Uncanny and Lost. The only known differences being the Gem Imprints and the locations in which they are found. "One of the trick weapons of the workshop, commonly used by those who dedicate themselves to the hunt. 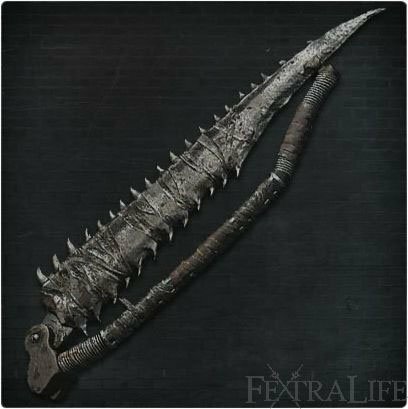 This saw, effective at drawing the blood of beasts, transforms into a medium-range spear. The saw, with its set of blood-letting teeth, has become a symbol of the hunt, and only grows in effectiveness the more grotesquely transformed the beast." Transforms between a saw and a spear. Requires Blood Stone Shards and Blood Echoes to fully upgrade. To perform a Transformation Attack, press L1 while performing another attack. Can be bought from the Bath Messengers, after obtaining the Saw Hunter Badge, for 1,000 Blood Echoes. Treasure in Central Yharnam Sewer, on the ledge above the dead end with boats. You also need to cut down the corpse hanging from the rafters high above. Contrary to what its name suggests, the spear utilizes slashes rather than thrusts (except in its R2 attacks), functioning much like a sword with extended reach. Both transforming attacks deal significantly more damage than basic attacks but are executed roughly as fast as the latter. Spamming L1 is a viable tactic that allows the hunter to dish out lots of damage in a short period of time. Enemies susceptible to serrated weapons receive around 15%-20% extra damage from both modes of this weapon. 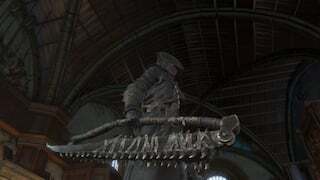 In saw form, this weapon has an identical move set to the Saw Cleaver in saw form. At 99 Strength, Skill and Arcane the Saw Spear+10 gains 193 physical bonus. R1 Combo 1.00x, 1.02x, 1.04x, 1.09x 20 Alternating slashes; starting with top right to lower left, then top left to lower right side, horizontal from right to left, then an upward slash from left to right. R2 Attack 1.20x 35 The saw is slashed from right to left horizontally with a brief windup animation. This does not combo, with the character resetting each time and performing the same attack repeatedly. Backstep R2 1.10x 35 Similar footwork to the backstep R1, except the right foot takes a small step with the attack occurring as the left foot takes a big step forward. The blade is raised very quickly in an upward vertical slash from near the character's left foot to overhead above the right shoulder. Dash R2 1.26x 45 (+run) The R2 while running looks very similar to the standard R2, but has a shorter windup animation and has the player crouched lower to the gounrd. Transform Attack 1.30x 23 (+x) Similar to the Saw Cleaver in that the player pushes the closed Saw Spear forward and has it extend. The extension of the blade is the actual attack as it snaps forward from unlocking. During dodging transformations, the weapon is brought from right to left, but other actions can lead to the attack animation going from left to right. Quickstep R1 1.09x 33~40 A quickstep left, back or forward results in a quick hop forward and a slash from left to right horizontally. A quickstep to the right slashes from right to left. Backstep R1 0.92 40 After the backstep, the character hops forward and thrusts the spear forward for what becomes a decent range poke. Dash R1 0.89x 35 (+run) The dashing R1 results in a thrust forward that looks like the backstep R1 attack. R2 Attack 1.34x 35 A short windup leads to a thrust forward that looks much like the backstep R1 and dash thrusts. Charged 1.75x, 1.55x 50 The weapon is brought back and held for a short duration before being thrust forward in a stab that hits the ground. Hitting R2 again will result in a slash from the character's lower left to upper right. This has a short delay between attacks but is only possible with this combo. Backstep R2 1.19x 35 The Saw Spear is raised overhead and as the character lunges forward onto their right foot, the blade is swept down veritcally into the ground. Dash R2 1.19x 45 (+run) The dash R2 is a faster version of the backstep R2 animation. While not identical, they are very similar with the most notable difference being in swing speed. Leap 1.34x 50 After leaping forward, the blade is thrust forward. This is effectively the same as the regular R2 after a small jump forward. Carried by Djura's Ally in Old Yharnam. This is better than the Saw Cleaver. That&apos;s a fact, not an opinion. Still, I use the Saw Cleaver more since it&apos;s the flagship weapon of the game. But, the Saw Spear does rule. The Saw Spear is to the Saw Cleaver like the Longsword is to the Broadsword. It&apos;s a choice between slightly higher damage or a much better moveset. Am I wrong or does this weapon (not transformed) attack faster than the cane? Saw spear > saw cleaver. Fite me. I found an Uncanny Saw Spear on layer 2 of my Central Pthumerian Chalice dungeon. the glyph is 2k4i4g6w right after you beat the first floor boss (undead giant, super easy) take the elevator up, the only door before the next lantern, the first left and past the cannon there will be a Watcher guarding a coffin, it&apos;s in there. Happy hunting! For an arcane build which Saw Spear is better for gems? I&apos;ve been using the normal one with fire gems but think that I could get more damage from Uncanny or Lost. This thing will work wonderfully on a quality or dex build. It may not scale as well in str as the saw cleaver but its serrated on BOTH forms unlike the saw cleaver or threaded cane and you get it early on enough so as to not need to spend any blood shards on them by then. Get an uncanny saw spear ASAP, farm for a triangle and two radial 27.2% physical blood gems and you&apos;ve won the game. Nothing will match the DPS of a full upgraded and blood gem fortified saw spear. If anybody is looking for a Lost Saw Spear glyph without offerings, try nkuwf5gh (Lower Pthumeru Root Chalice). The weapon is in Layer 2, main area (Layer 1 boss is Watchdog). Uncanny Saw Spear in the bonus area before lantern. Central Pthumeru Root, no extra rites. Could somebody explain me why do I keep getting Madman&apos;s Knowledge? I&apos;ve tried with three different glyphs and there&apos;s no result. Why? I&apos;ve unlocked this weapon in the shop, and I have not yet killed Priest Gascoigne. Perhaps there is something in the room that unlocks it when picked up, like the brooch, or perhaps simply seeing the boss at all will unlock it. If it&apos;s the latter, then perhaps it was meant to be purchased to help kill his beast form; I think this because of the line "...grows in effectiveness the more grotesquely transformed the beast." Found another lost saw spear on glyph 5sxfkxmh on layer 2 the area before the lantern. This weapon also appears to be used by the gattling gun hunter in the cave byt river of blood. That hunter also wears charred hunter set. Not entirely sure but I think this saw spear is preferred by hunters that are somehow related to Djura or powder kegs. How is the scaling? Does all get up to C/B? I created a Central Pthumeru Root Chalice dungeon with Fetid Offering. First one I ever made. Layer one pre-area bonus room had an Uncanny Saw Spear in a coffin. Layer three I found an Uncanny Threaded Cane in the same dungeon. Glyph code is 7r564exx if anyone is interested. Which would be the best if I&apos;m planning on putting all Fire Gems in it? Dungeon is Sinister Lower Pthumeru Root, and the glyph is: 3ukjayjk The Lost Saw Spear is in Layer 3 of this glyph&apos;s dungeon. There is also an Uncanny Rifle Spear in the side room before the first boss, Layer 1. Happy hunting! Can someone provide a glyph for the lost version that is actually still active? I keep getting expiration messages at the ritual altars.